The first time Cody and I made these pancakes, we kinda hated them. After a couple of days though, we decided to adjust the recipe a little and give it another go. This time, we loved it! 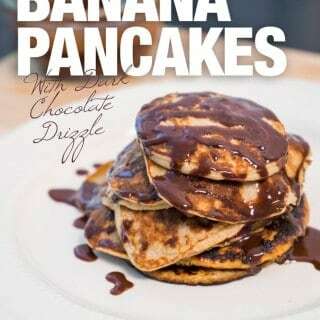 Cinnamon and Peanut Butter Flourless Banana Pancakes with Dark Chocolate Drizzle. The name might be a mouthful, but it’s beyond easy to make! We don’t really have time to cook an elaborate breakfast in the morning. Whatever we do needs to be super quick, nutritious and satisfying. This recipe ticks all the boxes. Quick = Hell Yes! Banana = Nutritious. Eggs = Nutritious. Satisfying = No doubt about it! If you don’t have a blender/processor yet, you should get one ASAP. You won’t regret it! We have the Ninja Master Prep Pro. A really affordable little piece of equipment that gets the job done. Check our Resources page [under the Contact Me button] for a link. We had this for breakfast today and then went for a 6 mile bike ride. It was scorching hot, so we stopped halfway for some lemon sorbet. Yum! We then strolled down the river walk, before heading back home. We’re really wanting to get into the biking scene and today was the start of that. Yay! Generally I’m not a big fan of sweet breakfasts, but this is a great way for us to switch it up every now and then. I planned this as a “treat” breakfast, but if you omit the drizzle, you could probably serve this more than once a week. Especially if you add some fruit on the side. Strawberries! Yes! Melt the chocolate with the cream over over low heat. Set aside. Put the banana, eggs, peanut butter and cinnamon into your food processor. Blitz until smooth. Fry for about a minute on each side. They color pretty quick, so be careful not to burn them. Keep it at a low/medium temperature. Stack them up, drizzle with chocolate and enjoy! Yep, takes less than 10 minutes from start to finish. Can't beat that!